The Chinese have their Super-Man, as well as a Bat-Man, Flash, and a versions of Wonder Woman. 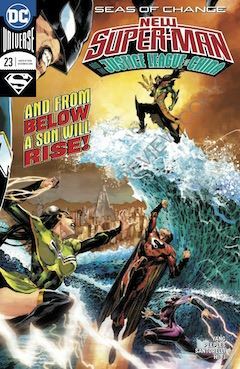 And in the story arc entitled “Seas of Change,” the Justice League of China adds an Aquaman to it’s roster. Well, no, not really. He’s a new take on the Aquaman of old, and he’s actually North Korean. Ahn Kwang-Jo is revealed to be the son of King Munmu, a legendary Korean warrior king who has passed into the realm of legend, becoming the mythical Dragon King. When Ahn’s water-based powers are revealed, he adopts the name Dragonson, and an appearance that is more akin to Aquaman’s foe, the Ocean Master. After Ahn escapes across the border to China, North Korea regards him to be a traitor to the party, and wants him back. The JLC debates internally their desire to help the young man, as well as their obligation to uphold the laws set down by their government. This leads to a rift within the team, until the Lantern Corps of China presnts itself as a common enemy. Overall, the story has depth. It presents a different take on Aquaman, if not entirely original (Just Imagine Stan Lee Creating Aquaman). However, continuing to build on the framework of the greater DCU is a flawed strategy, in my opinion. We already have a Justice League. Why do we need another?